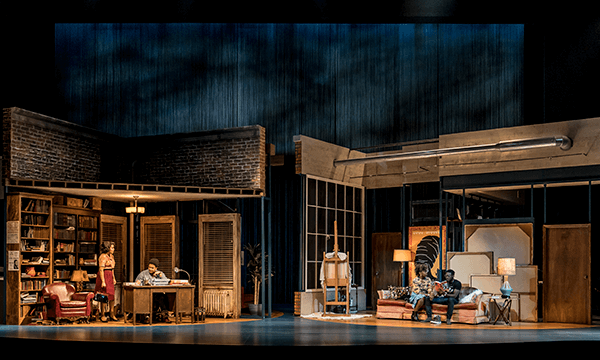 “How to Catch Creation,” a world premiere at Goodman Theatre, may sound like a how-to guide. But Christina Anderson’s new play is nothing like a step-by-step process. Six people making up three intellectual couples search for fulfillment. Two couples are presented in the present in 2014. The third couple’s actions begin back in the 1960’s. But their lives are all presented at the same time, almost as two syncopated poetry readings. During their journey of personal exploration they encounter snags of same and opposite gender attractions, divergent artistic paths and stereotypical thinking. And it’s all done on scenic designer Todd Rosenthal’s stunning set. It revolves as two halves – one for the two contemporary couples, the other for most of the 1960’s situation. The location is a California town similar to San Francisco and its area. Sorry we’ve been asked not to reveal the plot’s unusual twists. What you would realize early into the show, is that all the characters are black and that Anderson deliberately presents the actions and dialogue from a black perspective. But important as that perspective is, fulfillment desires and gender issues transcend race. Thus the play is meaningful on many levels. And under the direction of Niegel Smith who did “Father Comes home from the Wars” the cast superbly interprets Anderson’s sharp and clever dialogue.